Having just recently returned from a trip to the Southern US, I was really struck by the poor food quality and, in particular, the amount of sugary drinks and foods that were being consumed by adults and children alike. As somebody who must watch their sugar intake, I took a trip around a supermarket in a relatively affluent area and I was dumbfounded by the amount of food advertised as low fat or healthy which were just stuffed with sugar. The labelling of many products did nothing to highlight the high sugar levels. Dr Margaret Chan, the then Director-General of the World Health Organization (WHO), said in a speech in October that “in just a few decades, the world has moved from a nutrition profile in which the prevalence of underweight was more than double that of obesity, to the current situation in which more people worldwide are obese than underweight”. The role of adiposity (a fancy word for fatty body tissue) as an independent risk factor is strongest for diabetes, defined by WHO as fasting blood glucose equal to or higher than 7 mmol/L, or on medication for raised blood glucose, or with a history of diagnosis of diabetes. 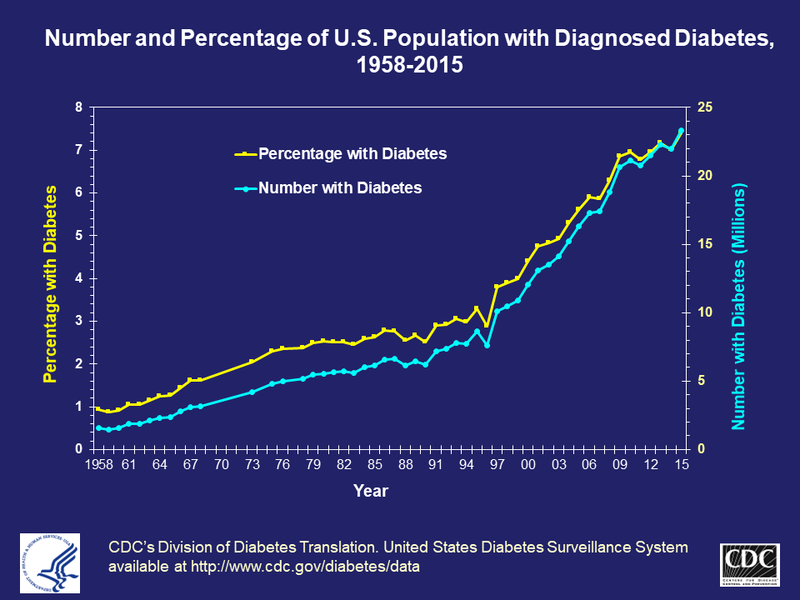 The global prevalence of diabetes in the adult population has increased dramatically in recent decades, nearly doubling from 4.7% in 1980 to 8.5% in 2014. The increase in the US is frightening, as the graphs below show. 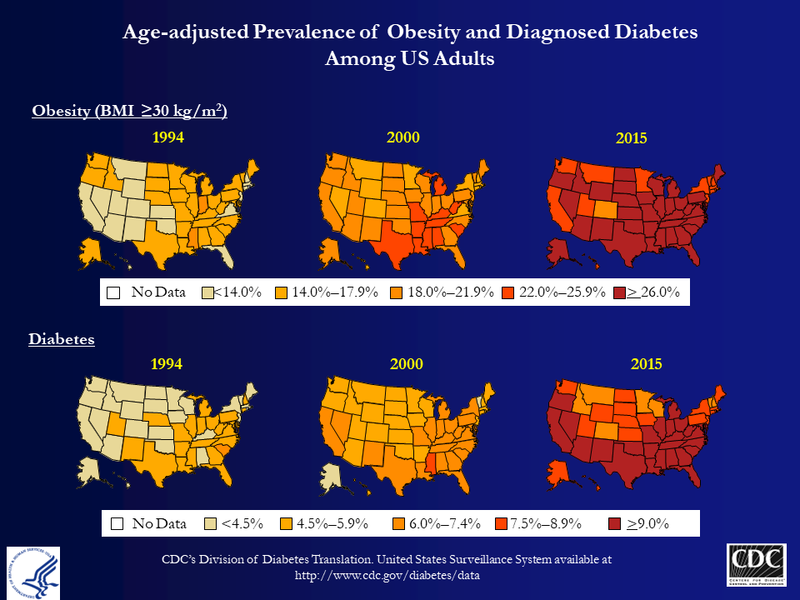 The increase in obesity and diabetes has not been confined to developed countries (where the prevalence is highest amongst urban dwellers and lower-income groups) with increases been seen globally, including sub-Saharan Africa and developing countries such as India and Mexico. China, with the world’s second largest economy, now vies with the US as the nation with the largest number of overweight citizens. In 2013, the Journal of the American Medical Association published a report by Chinese researchers where the authors estimated a prevalence in the adult Chinese population of nearly 12% living with diabetes, and in its most shocking finding, the study estimated that nearly half of the entire adult Chinese population has pre-diabetes, amounting to nearly half a billion people. This entry was posted in General and tagged adiposity, adult body-mass index, Agribusiness, Centers for Disease Control, China, Chinese population, diabetes, fasting blood glucose, fatty body tissue, food advertising, food quality, global obesity epidemic, high sugar levels, India, international food system, lower income groups, Margaret Chan, Mexico, National Institute of Diabetes, nutrition profile, obesity, overweight citizens, pre-diabetes, prevalence of diabetes, processed junk food, sub-Saharan Africa, Sugar Highs, sugar intake, sugary drinks, urban dwellers, WHO, World Health Organization. Bookmark the permalink.